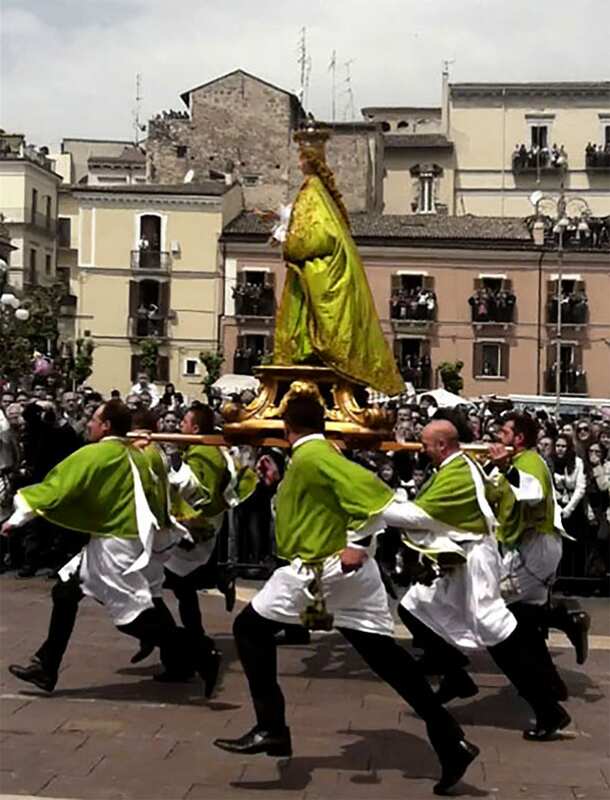 It’s difficult not to feel that Sulmona’s Easter re-enactment of ‘La Madonna che Scappa’ (Running Madonna) symbolises Spring throwing off the dark winter months and the growing green of Abruzzo as new shoots take hold. Whichever meaning you like to apply, the rush of hope and excitement of the Madonna as she races towards her resurrected son or that of Spring clipping the hungry months to bring new crops, livelihood and riches to happy families, it provides a great reason to swing by the medieval city of Sulmona (famous already as the birthplace of Ovid, sugared-almond Confetti and red garlic) on Easter Sunday morning. 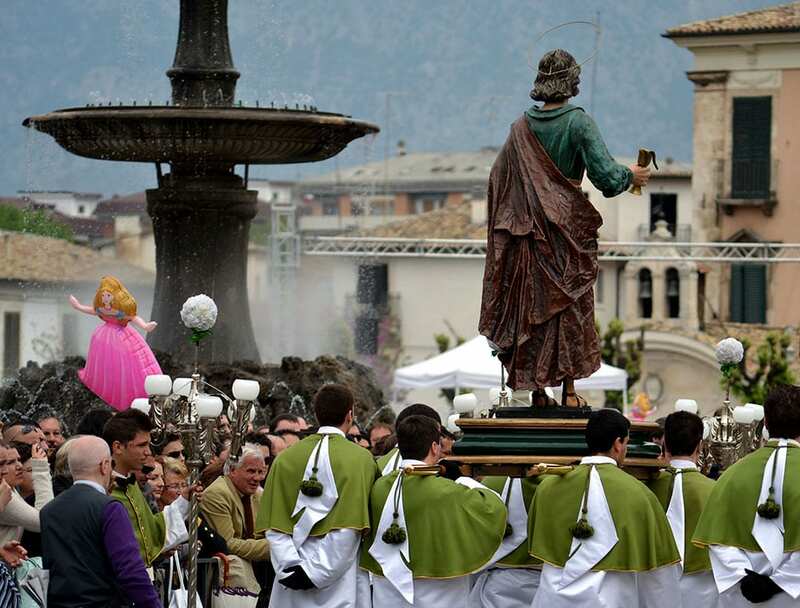 The ceremony has been taking place since the C11th, organised by the Santa Maria di Loreto Brotherhood, whose male members the Lauretani wear white tunics with a shiny green cape to symbolise purity & hope. It’s interesting that the younger members seem instructed not to wear earrings although individuals’ sneaky bangles & bracelets remain semi visible under all the symbolic robes. 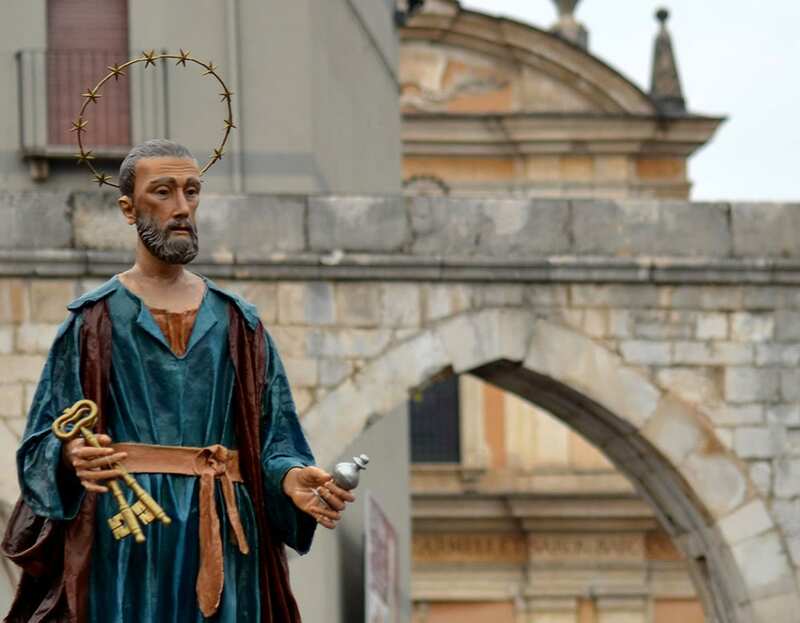 At noon the statues of the saints are paraded down to the C14th Chiesa di San Filippo Neri, where they take it in turns to cajole the statue of Madonna of Loreto, shut inside the night before her son is resurrected. 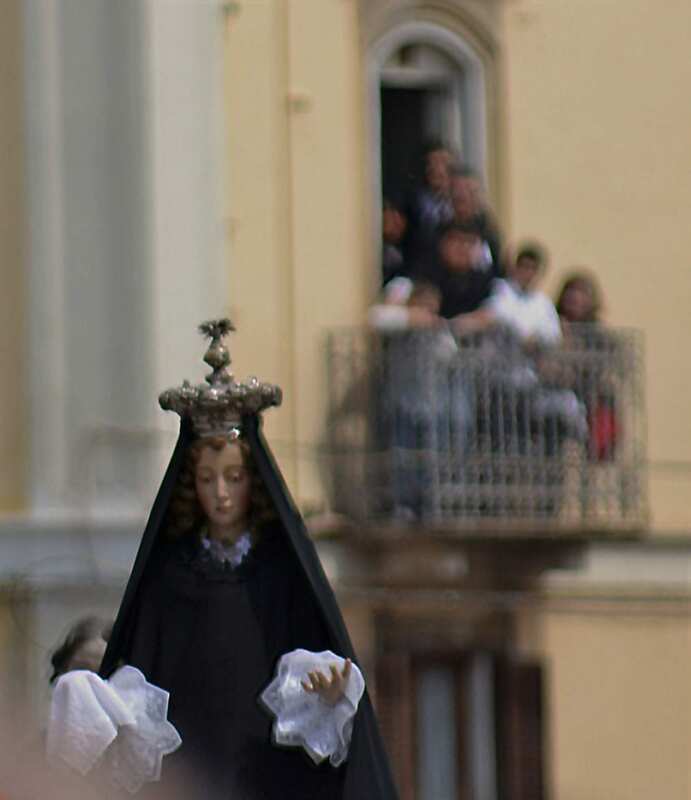 After three attempts she finally comes out of the church door held aloft by six Lauretani and dressed in a black mourning coat, holding a white handkerchief. Down the steps she travels and into the main passage of the piazza between the crowd followed by the two apostles. Suddenly she sees her reborn son and with a loud swoosh and a bang her mourning cloak is whipped away to reveal her bright green dress that signifies new life; twelve doves break free that are held under her cloak and bangers explode as the Lauretani dash and she appears to fly joyously, rather than run perhaps, to embrace her son waiting at the end of the piazza. 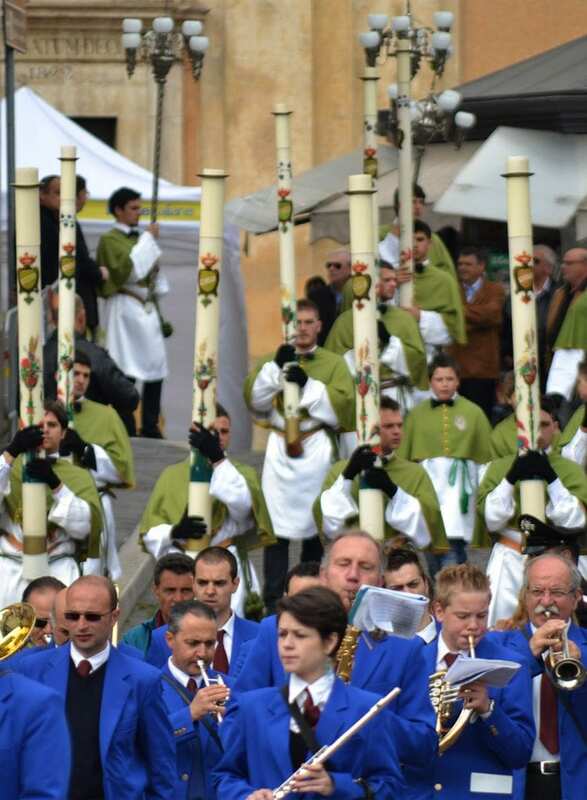 Bells peal, fireworks are left off, the band plays and the crowd embrace and celebrate the pinch of folklore and superstition that is attached to the enactment; if the mourning coat falls off correctly and the doves fly high it will be a bountiful year for their crops.